Give your little one a ride they won't forget with the Orion! this front-mounted child bike seat lets you keep your child close, while enjoying a fun bicycle ride. An innovative bracket system allows the Orion to be fixed to the head tube of the bicycle. This enables the Orion to be attached to the bike in a way that will not throw off the center of balance for the rider. Once the bracket is fixed to the bicycle, installation is a breeze with the "one-click" installation system. The unique design of the bracket also allows the Orion to be mounted on almost all types of support frames. It will fit bicycle frames from 32mm to 52mm (1.3" 2.0"). the Orion can also be mounted on electric bicycles (e-bikes). equipped with a suspension system, the Orion lets your little passenger have a fun and exciting ride, without taking in the bumps from the road. A 3-Point adjustable safety harness and Thermo formed, weatherproof padding keep little one cozy and secure. Safety straps, included on the adjustable footrests, prevent contact with the wheel spokes. 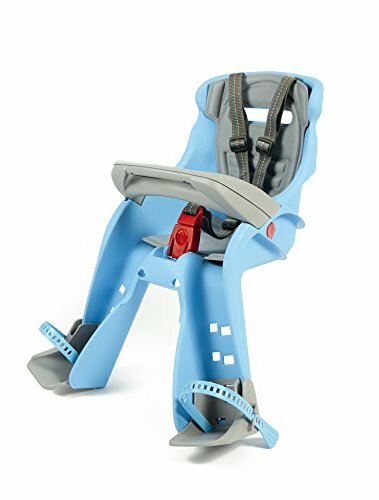 A detachable handle is included on the child bike seat for children up to 22 lbs. The position of the Orion allows the bicycle driver to keep a watchful eye on little one. 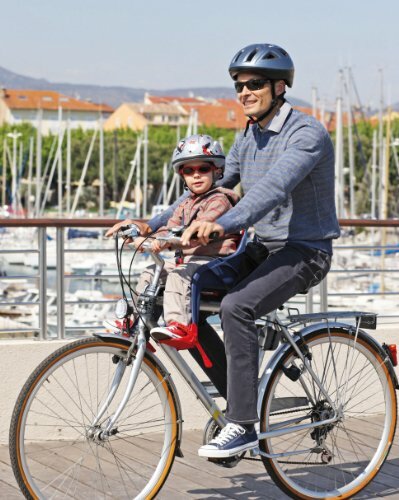 The bicycle driver will also feel a sense of security and comfort by being able to have their arms positioned around the child.